Let the loom guide your hand! What is it like to weave without a pattern, without preconceptions? Immerse yourself in a joyful free weaving style which teaches that everything, every piece of wool, blade of grass, or missing thread has its own beauty. Be inspired by the abundance of traditional and unusual materials that can be used in weaving. Make up your own composition as you go and create a wall hanging that is uniquely your own by using freeform weaving, knotting, loom-controlled patterns, and whimsical touches. 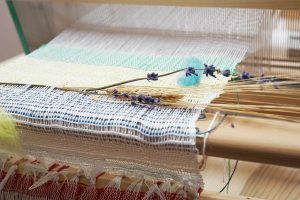 Students of all levels will get the chance to explore texture, fiber and materials on a pre-warped table loom, taking home a beautiful wall hanging!